Farmers Only, an exciting dating site for US and Canada based singles, offers a location-based dating service for those country folk looking for a farm life with their significant other. 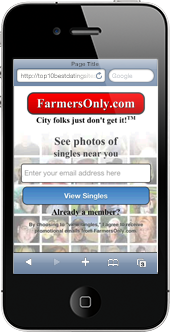 Farmers Only offers basic and advanced search, along with other matchmaking options, all from your mobile device! The mobile app provided by Farmers Only is supported by both Android and iOS operating systems, can be supported on most smartphones, and has a quick and easy installation process. After you’ve accessed the mobile version, you can create a profile, add a photo, begin chatting to other members and much, much more, all from your mobile phone. Premium Membership: starts at $9.49 per month. Farmers Only offers a simple and intuitive interface that makes looking for that perfect match fun and easy to use. Users can enjoy a secure mobile dating platform with Farmers Only. The majority of private information is secure unless the user specifies otherwise, and dating is made safe with privacy settings.